What Does Code P2123 Mean? OBD II fault code P2123 is a generic code that is defined as “Accelerator pedal position (APP) / Throttle position (TP) sensor/switch D – high input”, and is set when the PCM (Powertrain Control Module) detects an abnormally high input voltage from the sensor, switch, or circuit in the throttle control system that is labelled “D”. Note that code P2123 only applies to applications that use a “drive-by-wire” throttle control system in which there is no physical link such as a control cable between the accelerator pedal and the throttle plate. NOTE: “Sensor/switch “D” refers to a particular sensor, switch, or circuit in the throttle control system. However, since manufacturers do not all follow the same rules when it comes to labelling sensors, switches, and circuits, it is important to refer to the manual for the affected application to determine exactly which sensor/switch/ circuit is labelled “D” on that particular application. Failure to do this will result in a misdiagnosis, wasted time, and the unnecessary replacement of parts and components. Drive-by-wire throttle control systems typically use at least two position sensors to control the throttle opening. One sensor is attached to the accelerator pedal, and as the pedal is depressed or released, the internal resistance of the sensor changes. The variable voltage is used by the PCM as the basis on which to calculate and command an appropriate throttle opening by actuating a DC motor that is attached to the throttle plate. In terms of operating principles, both the position sensor that is attached to the accelerator pedal and the position sensor that monitors the actual position of the throttle plate are of the variable resistance type, and both sensors are supplied with a 5-volt reference voltage and a ground by the PCM. On sensors of this type, the reference voltage passes through a resistive element, and a moving part commonly called a slider, moves across the element as the accelerator pedal is depressed or released. In practice, the position of the slider on the resistive element determines how much of the reference voltage is passed back to the PCM via a dedicated signal circuit. For instance, if there is no pressure on the pedal, the accelerator pedal position switch is said to be in the “minimum stop” position on most applications, and the resistive element will pass about 0.5 volts back to the PCM. As the pedal is depressed, the position of the slider on the element changes, and progressively more current is passed back to the PCM as the electrical resistance in the resistive element decreases, until about 4.5 volts is passed back to the PCM at WOT (Wide Open Throttle). The position sensor that monitors the position of the throttle plate relative to a minimum (or closed) position works in exactly the same way, but in this case, the changes in the signal voltage is interpreted by the PCM as degrees of rotation of the throttle plate. In a fully functional system, the PCM is therefore able to correlate the movement and position of the throttle plate with the movement and position of the accelerator pedal. Thus, if the PCM detects that an abnormally high input signal voltage is present in the throttle control system, it will recognize that the sensor, switch, or circuit labelled “D” is operating outside of acceptable or allowable limits, and it will set code P2123, and illuminate a warning light as a result. On most applications, the PCM will also initiate a failsafe or limp mode as a safety precaution until the fault is corrected because the PCM cannot control the throttle effectively if some parts of the throttle control system operate outside of acceptable limits. Where is the P2123 sensor located? 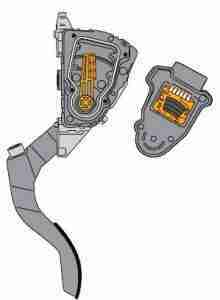 The image above shows a typical accelerator pedal/position switch assembly in which the pedal position switch/sensor (colored orange here) is incorporated into the assembly. Note though that the actual appearance and/or design of these assemblies vary greatly between applications. Also be aware that this assembly is generally not repairable, and that the entire assembly must be replaced as a complete unit if the position sensor cannot be detached from the pedal assembly as is the case on some applications. NOTE: If testing does not reveal a fault in the accelerator pedal assembly, it is possible that the throttle position sensor in the throttle body is defective. On many applications, this position sensor is incorporated into the throttle body itself, which means that the entire throttle body must be replaced if the position sensor fails. What are the common causes of code P2123? Note that although a “high input voltage” problem in a particular sensor, switch, or circuit in the throttle control system is not synonymous with a correlation issue between the accelerator pedal and throttle plate positions, it is possible for codes relating to correlation issues to be set by the failure of a particular sensor, switch or circuit in the throttle control system. However, since code P2123 specifically refers to a high input voltage problem in the throttle control system, the cause of the code is likely to involve only the throttle/accelerator pedal position sensors themselves or the wiring that connects them to each other and the PCM, as opposed to involving more generalized failures and malfunctions in other parts of the throttle control system that typically cause correlation issues. None found. Ask a question about P2123.